"...The "Midtown" brand, by comparison, has a brief history, is associated with a PR and development company..."
For at least the last decade, it has been a point of contention for longtime Detroiters that the area called "Midtown" is really more properly called the Cass Corridor. They have some points in their favor. The name "Cass Corridor" is rooted in history: The Cass Corridor takes its name from the old parcel owned by territorial governor Lewis Cass. The "Cass Corridor" has art and music movements associated with it, and local institutions used the name. The "Cass Corridor" has well-defined boundaries: It runs between Cass and Third from Michigan north to at least where the Wayne State University campus takes over. The "Midtown" brand, by comparison, has a brief history, is associated with a PR and development company, and has boundaries that flex and withdraw as investment and crime ripple through it. As one Cass Corridor resident used to joke, "When they build a condo, they say it happened in a place called Midtown. When there's a shooting, they say it happened in Cass Corridor!" Well, now that may be changing, as the neighborhood is almost universally called "Midtown." 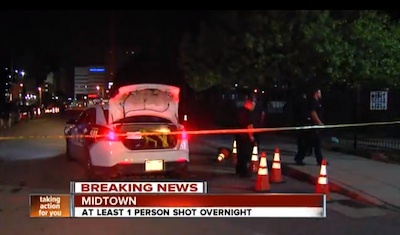 As proof, look at this news item, which places a shooting in "MIDTOWN" in Detroit. It may be an unusual barometer of the march of progress, but it represents one more blow against the place we used to know as the Cass Corridor. Dally in the Ally 2010. Photo by Jenny Calhoun. There’s a quiet turf war going down in Detroit. Or maybe it’s a capital-intensive neighborhood re-branding campaign. It really depends on who you ask. Whatever you call it, one thing is clear: the area of Detroit that runs along Cass Avenue — from Cass Park to the south and Wayne State to the north — is changing. It isn’t just the rumble of bulldozers clearing ground for huge new projects like the Auburn Building or the much ballyhooed Whole Foods supermarket. It’s the history, the identity of the place, that’s being forgotten. The area once universally known as the Cass Corridor is finding that its memory, its very existence, is being erased, overwritten and systematically re-categorized under the name Midtown. In the interest of celebrating and reinvigorating the rich cultural legacy of the Cass Corridor, Critical Moment has assembled this brief history of the neighborhood, collected from those who have lived, innovated, struggled and partied there. Many people think of the Cass Corridor as a poor downtrodden area, but the neighborhood actually started out as a rather upscale place to live, according to Ralph Hogg, a local blacksmith and elder Detroit activist. In the early days Detroit developed in a mostly unplanned fashion, spreading up and out from the river along the main drag of Woodward Avenue. Cass, which runs parallel to Woodward, sat close enough to this prime real estate to enjoy some of the city’s early affluence. This can be easily verified by walking through the neighborhood and observing some of the area’s more stately older homes. As Detroit grew, new homes branched out further and further from this main strip, becoming gradually less grand in scale. As the city industrialized small homes and housing for workers began to develop east and west of Woodward. Eventually, the area now known as the Corridor became an academic center, adding Wayne State University, then known as the Detroit Medical College, in 1868 and the College for Creative Studies in 1906. Ralph Hogg remembers John Pinette, a old-time member of the Communist Party USA who grew up in Appalachia. The two met organizing in the movement against the Vietnam War. According to Hogg, The Corridor really didn’t develop it’s modern identity until the 1950’s, when city politicians decided to clean up the slums over on Michigan Avenue, pushing a lot of the folks who lived there back to area by Cass Avenue. Jumbo’s Bar played a critical role in the cultural life of the neighborhood. Jumbo, the owner, was known as the Mayor of the Cass Corridor and looked out for many of the down-and-out vets who ended up in the area. Hogg said the vets used to mix with the university students back in those days. Unlike the rest of the city the Cass Corridor never experienced “white flight” to the suburbs. Ron Scott is a video producer, radio host and a spokesperson for the Detroit Coalition Against Police Brutality who grew up in the nearby Jefferies Projects. He explained why he thinks the neighborhood avoided this crippling trend. He said the Corridor of his youth in the 1960s was a jumble of different ethnicities and they got along fairly harmoniously. Scott said in those days the neighborhood was packed full of interesting places, personalities and creative endeavors. Sunshine recalls poets being an important part of the scene back then; John Mason stands out particularly in her mind. Others banded together to work on projects like the Artist’s Workshop, a collective that featured founders John Sinclair, George Tysh, Doug Larkins, Robin Eichele and scores of other writers, artists and musicians. Ken and Ann Mikolowski came out of the Workshop and started a small publication called the Alternative Press that featured work by well-known national poets and created a national audience for Detroit artists like Jim Gustafson, Faye Kicknosway and the much loved Corridor poet, rock-and-roller and activist Mick Vranich. Alongside and intertwined with this literary ferment, visual, sculptural and conceptual artists also emerged. Ralph Hogg spent a lot of time amongst this crew, sometimes called “The Cass Corridor Artists,” which he considered a fellowship of like-minded individuals. Gordie Newton, Sherry Hendrik, Bob Sestok, Arthur Wenk and Gilda Snowden are among the artists associated with the Corridor arts movement. Peter Werbe worked with The Fifth Estate, Detroit’s underground newspaper at the time. He said it was the voice of the counterculture for Southeast Michigan — and the Corridor was its cradle. According to Werbe there was no place like the Corridor in Southeast Michigan at the time. He said the politics ran deep then, and local activists could reasonably expect to gather around 20,000 people for an anti-war rallies. There were alternative institutions as well: a people’s printing press, an alternative school, a food coop. underground theaters. Werbe related these projects and the Corridor itself to autonomous areas that existed in Europe in the early 20th Century. The neighborhood’s political consciousness and activism began to recede in the 1970’s. Some of the folks interviewed attributed this to despair over the re-election of Richard Nixon, some to activist burn-out, others to authoritarian power plays by hardline activists within the anti-war movement. Yet, even as political activity began to wane, a great deal of the neighborhood’s cultural vitality remained. The Fourth Street Fair, a legendary street party, began its nearly 30-year run midway through the decade. Laura Freeman lived in the area near the tail-end of the 1970s. She managed the music spot Alvin’s with her boyfriend during those days and has happy recollections of the era’s music and culture. Freeman also remarked that the Cass Corridor experienced an upsurge of violent crime during the late 70s and early 80s. She said many of her happier memories of that time are tempered by the tragic deaths of many of the unique individuals she knew at the time, people like Cobb’s Corner proprietor Henry Normile, artist Bradley Jones and activist Henry Thompson*, brother of the famed Corridor restaurant impresario Honest John. The economics of the city also went into deep decline as manufacturers left Detroit in droves. Eventually the crack epidemic hit and prostitution, homelessness and street crime increased, becoming deeply linked with the area in the popular imagination. Nevertheless, the neighborhood kept its flavor, its culture and — perhaps more then ever due to the bad press — its attitude. Another dramatic change during the 1980s, was the transformation of The Fifth Estate, the Corridor’s counter culture voice, which reinvented itself as an explicitly anarchist journal. The philosophical shift was due in no small part to Detroiter Fredy Perlman. Perlman, a native of Czechoslovakia, exposed the Fifth Estate crew to newer ideas from Europe like Situationism — as well a critique of modern technological overreach. Peter Werbe, who is still active with the paper to this day, said Perlman’s influence allowed the Fifth Estate to break new ground, while most of the papers former allies in the underground press went under and disappeared. A decade later In 1993, the spirit of anarchy would echo even more soundly through the neighborhood with the founding of the Trumbullplex Theater, a DIY space and anarchist collective that popped up just west of the Corridor across from the Lodge Freeway. The Plex, as it is sometimes know, enlivened the nearby Corridor with a new wave of activism from groups like Anti-Racist Action and Food Not Bombs and publications like Babyfish and Active Transformation. The Trumbullplex was followed in turn by Idle Kids, a DIY space and zine shop on Second Avenue. As the 80s turned into the 90s, the Corridor continued to serve as the matrix of a lively art scene. Many of the creative people involved with today’s Detroit Artist’s Market were active at the time at the Willis Gallery, located on the spot the Avalon Bakery now occupies. The 404 Willis, a punk rock venue shared the same street with the gallery and a communist book store called Revolution Books. The artist Jean Wilson, hung out with many of the folks in the Willis arts scene starting in the late 1980s. Music and poetry continued to have a presence as well even as the corridor began to feel the increasing hand of gentrification around the turn of the millennium. The poet and singer David Blair, who recently passed away, was a popular younger figure in the Corridor arts movement. He ran the “open mic” at one of the most memorable cafes of the time, The Bittersweet. Although the Cass Corridor has changed dramatically in the last few years. Many of the folks who remember it’s heyday still frequent remaining local hot spots like the Bronx Bar, Jumbo’s and the Old Miami, as well as newer additions like the Cass Cafe, Avalon International Breads and the Motor City Brewery. Recently there have also been sparks that could lead to a cultural resurgence. The Thistle coffee house down on Second Avenue has become a hot spot for many of the artists, activists and everyday people who live, work and relax in the neighborhood. The North Cass Community Union, which organizes the Dally in the Alley has been rejuvenated by a new generation of youth. The Unitarian Church now operates as the Cass Corridor Commons under the guidance of an organization called the East Michigan Environmental Action Council which houses several social justice groups and works to preserve the the ideals of the Corridor. Young activists calling themselves the Detroit Underground Initiative and members of the Industrial Workers of the World meet regularly to share food and good times with the hard-struggling folks who live around Cass Park. Many of the young activists from Occupy Detroit frequent the venues old and new in the Corridor. Perhaps with the cooperation of Corridor elders and the participation of these newer actors the Corridor can shake off the challenges of historical revisionism and gentrification. Peter Werbe summed up the importance of this effort, calling the Corridor the source of our region’s wisdom, adventure and culture. A special thanks to Laura Freeman, Ralph Hogg, Ron Scott, Susan Sunshine, Peter Werbe and Jean Wilson who made this work possible. This is of course an incomplete history. The excellent website Tribes of the Cass Corridor offers many more historical accounts of the neighborhood. Please watch this site for additional interviews from this oral history project. Correction: An earlier version of this article made reference to a beatnik cafe named Winwell’s. Winn Well is in fact the name of a person, a bohemian poet who lived in the city at the time. Our apologies for this confusion.